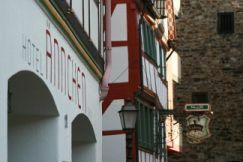 Our Hotel is located at the pedestrian area inside the old walls of the romantic mediaeval red wine town of Ahrweiler on the Rotweinwanderweg (red wine walking trail) and the Ahrsteig. It is an ideal starting point for your stay in the Ahr Valley. Our hotel, which have been family-owned for than 50 years, provides 24 modern comfort double rooms which are all non-smoking. Enjoy you stay in our Hotel garni and the charm of the historic centre of Ahrweiler. Bad Neuenahr-Ahrweiler, the town with two faces: Ahrweiler, the mediaeval red wine metropolis with its ancient, fully preserved town walls and the four town gates where countless street cafes, wine bars and small retail shops invite you to take a stroll and Bad Neuenahr, the sophisticated spa and wellness town with the wellness centres of the new Ahr Resort, the Ahr thermal baths and the Bad Neuenahr casino. We will be happy to assist you for your stay in our valley. Surrounded by woodlands and sloping vineyards, excellent hiking trails through the Ahr valley and the vineyards are provided for those in pursuit of relaxation. The Rotwein­wanderweg (red wine hiking trail) from Bad Bodendorf via Ahrweiler as far as Altenahr is particularly popular. The Rotwein­wanderweg (red wine hiking trail) is only a few hundred metres away from the hotel. This trail is recommended for a short hike on the banks of the Ahr to Bad Neuenahr or Walporzheim. In addition, hikers in the Ahr Valley and on the Rotwein­wanderweg (red wine hiking trail) are mostly blessed with sunshine and warm weather. Rotwein­wanderweg Hiking makes you thirsty and hungry. In wine-growing locations and on the Rotwein­wanderweg (red wine hiking trail), there is something for everyone, whether it be a small seasonal tavern run by a wine-grower, a tourist magnet or a gourmet restaurant, You can find something to suit every palate and every budget. The Ahr valley has a Mediterranean micro climate which provides ideal growing conditions for red wine. Consisting of just over 500 hectares, the Ahr is one of the small wine-growing areas in Germany. 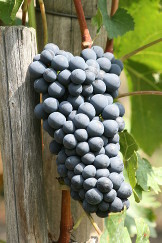 85% of the area is used for growing red wine, of which more than half is Spätburgunder (pinot noir). The main wine-growing areas are: Heimersheim, Bad Neuenahr, Ahrweiler, Walporzheim, Marienthal, Dernau, Rech, Mayschoss and Altenahr. The Ahrsteig, an alternative hiking trail along the river, follows the course of the Ahr from its source in Blankenheim to the mouth of the Rhine at Kripp, with various levels of difficulty. It is a new graded hiking trail with alternating degrees of difficulty along the route which is approximately 90km in length. The Roman Villa and the Government Bunker Documentation Site (Bunker Museum) allow you to experience history at first hand in Ahrweiler. They are not far away from the hotel on the Rotweinwanderweg (red wine hiking trail).